A cream or neutral colour kitchen can create a blank canvas just as white can but in a softer, more subtle way. Ranging from very pale, almost white cabinets to creamy lattes and taupes, these kitchens can please even the pickiest of home designers. The Lucido and Integra ranges still look very modern in neutral tones. Team with deep browns or blacks for high contrast or keep the whole scheme very light with white/cream colour schemes. Softer than a stark white kitchen but displayed in styles on the modern side of traditional, nothing creates a contemporary feel in the kitchen than a subtle cream or coffee tone. Where the Gloss range in white looks super modern, in coffee it offers a feeling of sophistication and warmth. Likewise, the Urban range is simple but has detailing options and off white ranges to tone down the starkness of modern while still seeming fresh. Creams and beiges are the natural choice, along with wood, for the traditional farmhouse style kitchen. Extra detailing on doors, tongue and groove and intricate handles combined with big wooden tables and traditional accessories create a feel from the past but that is still relevant to modern lifestyles today. Check out the Pendle and Cottage ranges for great examples of this. 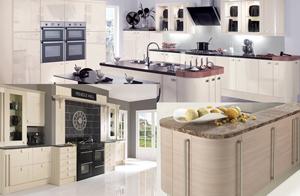 You can browse these and other Cream & Neutral kitchens in our Kitchens by Colour gallery. For help planning your kitchen why not book a consultation? 2 Responses to "A closer look at our Kitchens by Colour: Cream & Neutral"